Tocantins has been a cattle breeding state during the past 3 centuries, step by step changed into an agriculture state by large (foreign) investors. It is not hard to understand that this state, being far from the coast, has no tourism culture. Like many other Brazilian states that are not connected to the coast, touristic structures are absent. That means that many hotspots are still to be discovered, recognized, polished up, communicated and made accessible. On the other hand the state government has large expectations, and believes that the state has an enormous tourism potential. Several departments and organizations have been created to start mapping the potential and to develop structures. At the same time the Ibama, the organization that protects natural treasures, has an open mind to make parks and other protected areas accessible for visitors. Below you find a text* that shows how the government is promoting the potential. What has Tocantins to offer at this moment ? Extreme sports like offroad and rafting. Tocantins is a pleasant place to travel. People are friendly and hospitable, and the roads are good. There are no breathtaking sceneries, but the landscape is a nice mix of inhabited savanne and pastures. To enjoy wildlife you must make an effort: you should hike, boat and camp to encounter wild animals. The capital, Palmas, is the ideal city to stay. It is small, convenient and there are many good hotels and restaurants. 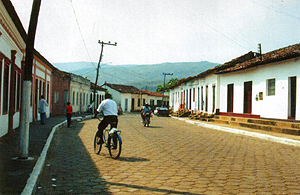 Palmas is also being developed as the touristic capital of the state. The State of Tocantins has a huge ecological tourism potential, thanks to its several natural attractíons, with breathtaking landscapes spread all over ís territory. Its exuberant flora and wildlife are sure to delight even the most demanding sightseer. Apart from these, there are also historical and cultural attractions, which are being preserved in the old towns together with their traditions and folklore. The State's scenic variety is due to the fact that it is a transition among the cerrado, pantanal, semi-árido and Amazon forest ecological systems, all fusing harmoniously; creating exquisite settings. Its main rivers, the Tocantins and Araguaia, have an extensive course, flowing an almost parallel route dotted with beautiful surroundings, decorating the nearby cities with a bounty of river beaches, plenty of fish and with an enormous ecological tourism potential. Tocantins State has many attractions to suit all tastes. 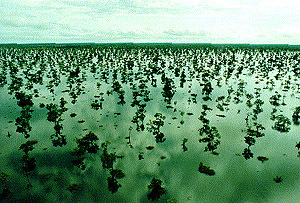 Spread over the 10 program areas in which the State has been divided for the implementation of the regional development program, tourists have options ranging from archeological sites to beautiful virgin river beaches, covered with fine white sands at the Araguaia river banks, along with historical towns, mountain ranges, savannas and other features appealing to the adventuresome tourist. The State's several tourist destinations are far from being fully developed to their potential, leaving ample room for growth of the regional, national and even international ecological tourism trade. Most of its attractions are the fascinating river beaches, islands, falls, valleys and mountain ranges and a pleasant temperature all year around is bringing an increasing flow of tourists. In the dry season, when the Tocantins and Araguaia Rivers flow is reduced, several beaches arise in an exotic scenery sunny and mild, with almost virgin white sands. It goes from June to September, and is attracting visitors from all over Brazil and even from abroad. During the season, the State Government and municipal, administrations provide the basic infrastructure like power, water and sewage lines, boats, security, medical services, rescue, telephone, banks, sports arenas and stages for shows and presentations. Because of its huge touristpotential, Tocantins is wide open to investments. The Government offers all support to prospective investors, including project elaboration and analysis, information on the specific project and assistance in getting financing with (Federal Government Credit Agencies and with commercial banks. There are several opportunities in lodging, catering, tours, transport, health, communications, sport, cultural and leisure activities, theme and water parks, social and sports clubs, personnel training, camping, hunting and fishing clubs. 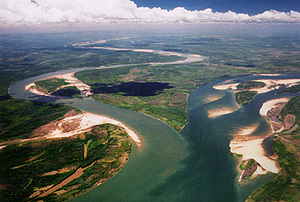 In one of the most paradisiacal sites, on the Araguaia river right bank at Bananal Island Extreme North, the State Government, together with private investors, is carrying on a pioneering ecological tourism project, the "Cantão Project”, with a lodging complex, airfield and a complete leisure structure for even the most demanding tourist. To preserve the fragile environment, access to the project will only be possible by river or from the air. With so many investment opportunities, the State is implementing a Tourism Policy satisfying the visitors while protecting the State's cultural heritage and preserving the environment.